As an American, living abroad for 17 years, in 107 countries, calling me a Volunteer, NGO, or even a Travel Writer is an insult, watch your tone of voice. I am 59 years old. I am not some dumb farm boy from Orland, Indiana, as some of the big city New Yorkers enjoy thinking I am. I am a man who has lived outside the USA now for over 17 years, in 107 countries. After living in what people politely call “developing nations,” and impolitely call, “poor countries,” for 17 years we savvy Expats learn to rant against NGO’s, NonGovernmental Organizations. The AID organizations, Charities, the Missionaries, the volunteers, that all look down on Expats as if we are dirtying ourselves, by actually wanting to live in, and live with, and be part of the people they came to save. Or worst, the truly lost in lah-lah land say, “I give to a charity, which goes to help Africans to eat.” (Spoken with the tone of voice, "I did my good part, I gave to save the poor, so you too can look at me with respect.") They think I went to Africa to save the people of Africa. I think to myself, Please, African woman are fat. Here in Kpalime, Togo, I can go to the Bon Vivant Restaurant, owned by Maria, and Yan, who are from YEVO Belgique, and from 12 noon until 8:00 pm I can find 1 to 30 of these people who are here in Togo to volunteer, work on projects, or working in development. Every one of them is eating, or maybe drinking their meal. Bon Vivant is a great place to find Peace Corp volunteers, and they are right, do you know what a “Bon Vivant” is? When I go the Bon Vivant, it is sometimes very quiet, calm, and civilized. Maria, the mother, is a quiet, respectful person, she is calming. Togo should never be called calm, chaotic yes, but not calm. I like to eat my French Fries, drink my soda water, and find a little calm by being around Maria. "Forgive them, God." I am not clear on why, but this phrase makes me feel better when I say it. I want God, and me, Andy Lee Graham, to forgive these volunteers’ for taking billions of USA aid money, and drinking it, squandering it, abusing our good faith in God, man, and the American way, the American dream here in Africa . . . aagh, it is easy for me to rant. It’s a “Charley Foxtrot,” - my mother does not like it when I use profanity, go look up that Vietnam soldier lingo if you do not know it. He is a small boy. When we get old in Togo we get to classify young people as small, not young, but small, they are petite in the French language. Hmm, this word seems to be correctly used in English and translates differently in French. 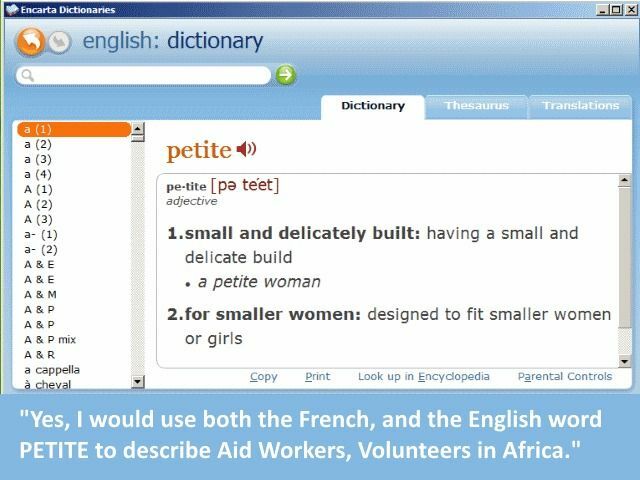 Petite is small in French. 2. for smaller women: designed to fit smaller women or girls. YEH VOE - Read in the English way. "White man, white man, good afternoon, how does it go? Thank you." And the good reply is, "Yes, it is going . . . Qui, ca va."
Ranting against the Togo children, who sing with loving body language, a voice with as much love as anywhere on the planet, and with huge smiles is creepy. To not like these children? How can you even possibly get angry at the children here in Togo? All they do each day is throw love at us “YEVO” White people, they speak Ewe, and these children do not even know what the words mean. You Volunteers, you “PETITE” minded people came here to save them, to help them, and you hate them . . . you refuse to love them back. Do not get me wrong, the Grand Togolese people can be trying. I have to remember it, is their country, they have the right to live as they wish, it is not my country or culture. Well, here I am in Kpalme, Togo, and I find I have joined the Team, the losing Team, the Volunteers who come to Togo to save the world. I am going to volunteer to be the Director of a small Vocational School of 100 Togo students in Gbalave, Togo, just outside Kpalime. At this school, they learn woodworking, carpentry, masonry, sewing, and hair styling, all trades that are in abundance and needed in Togo. I guess I have hope, I know that these “petite” volunteers are not bad people, they just do not know how to connect the dots. 90 percent of Volunteers in Africa are below the age of 25. Volunteering to help Africans, yet, they possess no skills, knowledge, or experiences that can be shared, they are young, trying to save a continent. So here I am, Andy Lee Graham who hated being called a Real Estate Broker in Indiana (most are idiot crooks). Who hates being called a Travel writer (99 percent lie, lie, in return for freebies Hotel Rooms, Airfare, they write advertisements for money). Now, have the label "volunteer" on me. I was an honest Real Estate Broker in Indiana selling 80-100 properties per year. I am an honest travel writer. I will never get rich being a Travel Writer, a profession that requires you to lie. I can be a writer that travels, though. I can be an honest volunteer, who is 100 percent aware that getting paid in Togo would be a violation of my Tourist Visa. My goal is to bring Amazon, Ebay, and Etsy super sellers to Togo to live for free. Have them come to the School, to teach the students how to make their wood or clothing products. I have volunteered to show Gbalave, Togo West Africa how I sold $2500 worth of products on Amazon FBA last month. I want other Americans, Europeans to come utilize the cheap labor of Togo, 2-5 dollars per day, so they can get rich. When they get rich, the Togo people get rich. Win-win, teaching the Togo people how to fish, and not giving them fish. Do you know the story about the fish? I dream of twisting a phrase the same as Mark Twain. Mom, it takes all my remembrance of you, and Dad to not use the profanity that “Charlie Foxtrot” means to describe the Aid Organizations of Africa, good people who just do not get it that all the geese can fly the wrong way. Here I am dreaming of steering them the right way, but we all need hope. And I am tired of ranting.